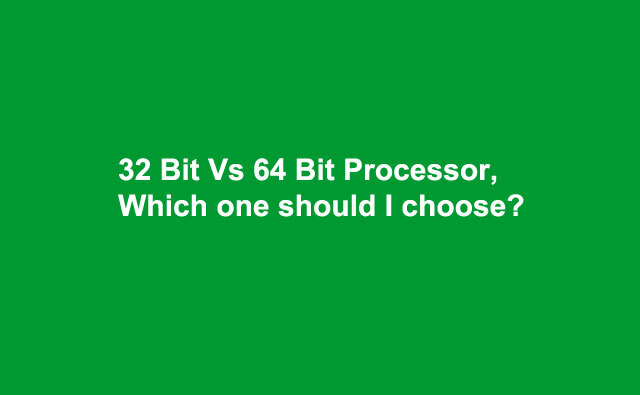 What is the difference between a 32-bit and 64-bit Processor? Home / Windows / What is the difference between a 32-bit and 64-bit Processor? At the moment there are 32 bit and 64 bit processor type, the main difference is hardware architecture that allows more instruction per second executed in 64 bit processor, thus the performance will better in a computer with 64 bit processor. 32 bit processor only can run 32 bit operating system, while 64 processor can run 32 or 64 bit operating system. The other reason is maximum memory can be recognized and utilized by the system. When using 32 bit processor it's maximum memory is 4GB regardless of what Windows Edition you are using. While in Processor 64 bit can up to 192GB in Windows 7 depend on what windows edition you are using. In Windows 10 you can add up to 2TB RAM (memory). If you are using high intensive memory usage like database applications and video intensive application then the more memory you have, the better your system running.